It just figures. You’ve been a good little shopper, using your rewards credit card diligently to rack up the points, and it’s finally time to redeem them for that trip of your dreams — when you hit a blackout date. Trip canceled. Rewards may be one the of the best reasons to use your credit card these days, but most companies don’t make it easy to reap those rewards. Those who are tired of the blackout grind have turned to Capital One No Hassle Rewards® cards. The name “No Hassle” is more than just hype for Capital One, which allows users to redeem points, miles, and cash back rewards at any time, without facing redemption restrictions. 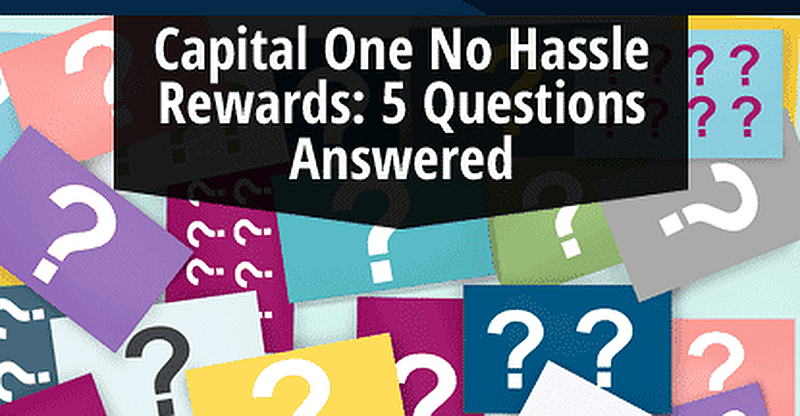 Get answers to our top seven Capital One No Hassle Rewards® card questions below. 1. Where Can I Apply for a Capital One No Hassle Rewards Credit Card? The most convenient — and informative — method for getting to the application is to use the links on any of our Capital One credit card reviews, where you can compare cards, pick your favorite, and go straight to the application. The application process requires you to answer basic questions about your identity, income, and employment. Applications can be approved in as little as 60 seconds for well-qualified applicants. If your application needs to be reviewed, it may take up to a week before you get notice one way or the other. 2. Which Capital One Rewards Cards Have the Best Reviews? 3. How do I Redeem Points & Miles through the Capital One Rewards Catalog? Capital One takes its No Hassle policy seriously, making it simple to redeem your rewards at any time. Redemption can be done through the website by logging into your Capital One account. You can also cash in your rewards through the Capital One mobile application. However you access your account, redemption will occur through the rewards catalog, where you can see the variety of redemption options. Your Capital One rewards, including miles, can be redeemed for flights, hotels, or even gift cards. For a miles card, you’ll likely see an equivalent value of around $0.01 per mile redeemed — so your 40,000 miles will net you $400 in travel. Your cash back value will vary based on your card offer, but averages around 1.5% of your purchases. 4. Can I Get Cash Back with my Capital One Rewards Card? You can actually get cash back from your Capital One rewards cards in two ways. The first is to get a dedicated cash back card, such as the Capital One® Quicksilver® Cash Rewards Credit Card. If you have a Capital One miles card, but can’t use up all the miles you’ve accrued, you can get cash back from your rewards, too. Miles earned with your rewards card can be redeemed for a cash and gift cards at any time. 5. How do I Check the Status of Capital One Rewards? All the rewards in the world won’t do you any good if you don’t know you have them. Thankfully, checking the status of your Capital One rewards is as easy as signing into your account dashboard, either through the website or mobile application. From your account dashboard, you can check on your rewards or redeem your points and miles, at any time. The “No Hassle” in Capital One No Hassle Rewards, means you can get the rewards you want, when you want, without fear of blackout dates or other redemption restrictions.